In the last Saturday à Machen, we had the opportunity to consider Machen’s argument for the miraculous occurrences of the New Testament. But in order to arrive there, he had previously addressed the idea of the “supernatutural” and the character of miracles, in that order. Since we started at the end, so to speak, let us then pursue Machen’s argument backward, moving from the particular to the general. “[I]t has often been said that all events are works of creation. On this view, it is only a concession to popular phraseology to say that one body is attracted toward another in accordance with a law of gravitation; what really ought to be said is that when two bodies are in proximity under certain conditions they come together. Certain phenomena in nature, on this view, are always followed by certain other phenomena, and it is really only this regularity of sequence which is indicated by the assertion that the former phenomena ’cause’ the latter; the only real cause is in all cases God. On the basis of this view, there can be no distinction between events wrought by the immediate power of God and those that are not; for on this view all events are so wrought. Against such a view, those who accept our definition of miracle will naturally accept the commonsense notion of cause. God is always the first cause, but there are truly second causes; and they are the means which God uses, in the ordinary course of the world, for the accomplishment of His ends. It is the exclusion of such second causes which makes an event a miracle. “It is sometimes said that the actuality of miracles would destroy the basis of science. Science, it is said, is founded upon the regularity of sequences; it assumes that if certain conditions within the course of nature are given, certain other conditions will always follow. But if there is to be any intrusion of events which by their very definition are independent of all previous conditions, then, it is said, the regularity of nature upon which science bases itself is broken up. Miracle, in other words, seems to introduce an element of arbitrariness and unaccountability into the course of the world. “The objection ignores what is really fundamental the Christian conception of miracle. According to the Christian conception, a miracle is wrought by the immediate power of God. It is not wrought by an arbitrary and fantastic despot, but by the very God to whom the regularity of nature itself is due— by the God, moreover, whose character is known through the Bible. Such a God, we may be sure, will not do despite to the reason that He has given to His creatures; His interposition will introduce no disorder into the world that He has made. There is nothing arbitrary about a miracle, according to the Christian conception. It is not an uncaused event, but an event that is caused by the very source of all the order that is in the world. It is dependent altogether upon the least arbitrary and the most firmly fixed of all the things that are—namely upon the character of God. This is, of course, some sound reasoning for theists to believe in miracles. Theological liberals, however, will remain unpersuaded, I’m afraid. The real problem for them is that it’s not respectable, i.e., fashionable, to believe in miracles. What they want more than anything else, I feel, is to be ‘cool’. Indeed. 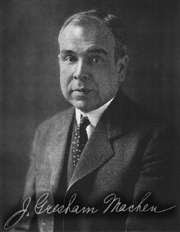 The problem, as Machen understood quite well in spite of his philosophical commitments, is one of presuppositions. In fact, his whole argument here is based on this understanding of the issue: “Christianity” has theistic and supernaturalistic preunderstandings that “Liberalism” has abandoned–one of many things that causes them to be different religions. It all boils down to whether you believe in an omnipotent God or not. To be frank, “liberals” do NOT believe in an omnipotent God, and all their notions spring from that ontological grounding. All their other vapourings are nothing but variations on that theme. If God is not Omnipotent, then, who is? Is it is any surprise that they place themselves in that position? Read Aleksandr Dmitirievich Schmemann, and you shall see a classic illustration of liberal hubris and condescension. The Decalogue says, “Thou shalt have no other Gods before Me”. That includes the ridiculous proposition that one can judge all of all Christian history and practise by one’s personal yardstick, for that is reserved to God alone. Something to think about… it makes sense to this non-theologian. One hears the faint echoes of his good friend Cornelius Van Til. Yes, precisely! In final analysis, this is an argument from theistic presuppositions. I think that the wedge between Machen’s and Van Til’s apologetics is very often overstated, and reading Machen’s apologetic works often puts the lie to that idea. And while it is true that Machen was no full-blown presuppositionalist as we currently understand that term, one can indeed hear the “faint echoes” of such an apologetics in his own. After all, Machen seemed to be nothing but pleased that Van Til took the professorial appointment in apologetics at Princeton that he himself was to have taken, and later gave no evidence of dissatisfaction with Van Til’s approach as he taught it at Westminster (and 1928-1936 was more than enough time for Machen to have said something if that hadn’t been the case! ).